OnlineCityTickets.com is proud to offer every customer a 100% Buyer Guarantee. The 100% Buyer Guarantee means that your transaction will be safe and secure, the tickets will be delivered prior to the event, the tickets will be identical, comparable, or better than the tickets you ordered, and the tickets will be valid and authentic. If we do not meet these aforementioned standards, we will gladly refund your complete purchase price. Our sellers work closely with venues all over the world to make sure that your event experience is unparalleled. OnlineCityTickets.com is a safe and secure way to purchase tickets on the web. We are proud to offer this guarantee as we stand behind our outstanding customer service team. Your satisfaction is our goal. We have provided over one million customers entrance to events across the world. If you are unhappy with your purchase, please contact us immediately at (800) 854-2196 or email support@onlinecitytickets.com. Inventory We are a resale marketplace, not a box office or venue. Ticket prices may exceed face value. This site is not owned by Orpheum Theatre Sioux City . 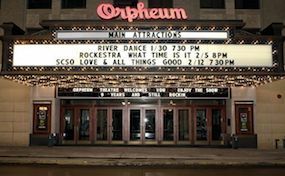 The Orpheum Theatre located in Sioux City, Iowa, is a performing arts center and is home to the Sioux City Symphony Orchestra. Originally it was a Vaudeville and movie palace when the venue opened its doors in 1927 with a seating capacity of 2,650. In 1999 the facility was carefully restored, placing great care on restoring the original Wurlitzer Pipe Organ. The restoration took two years to complete and has since been a popular spot for tourists and locals alike. It features stunning chandeliers and beautiful hand carved detailing inlaid into the walls. The Orpheum Theatre in Sioux City’s Box Office is located at 5228 Pierce Street, Sioux City, Iowa. TheatreSiouxCity.com is not associated with any primary supplier, box office, website, venue, and or promoter. We are a privately owned and operated business specializing in sales in the resale secondary market. Prices on our sites are often above face value but will change quickly with market conditions. To buy tickets for any Orpheum Theatre Sioux City events simply click on the event of interest or call our operators at anytime.